My next comic to look at is Green Lantern (Volume 4) #55, Doug Mahnke variant. Awesome Lobo cover! Originally Stanley Lau was actually supposed to do the variant for this comic, but at the last minute he ended up doing the variant for 56 instead. I could only imagine how great that could have been! The print run of #55 was 85,000, so there is approximately 3,400 of these out there. You rarely see these on the bay at all. The last one actually ended at $15.50. Honestly speaking, I have never been a huge Green Lantern fan, so other than this being a Brightest Day tie-in, I do not know very much about the comic itself. But what I do know is this cover will be had by any Lobo fan out there. It seems very “Thanos-esque”. This has got to be one of the best Lobo covers in my opinion. Happy Hunting fellas! This is a pretty cool cover. Lobo never gets love anymore! Also, I hate that the new lobo killed the old lobo. Lame. That is a great cover, thanks for sharing! 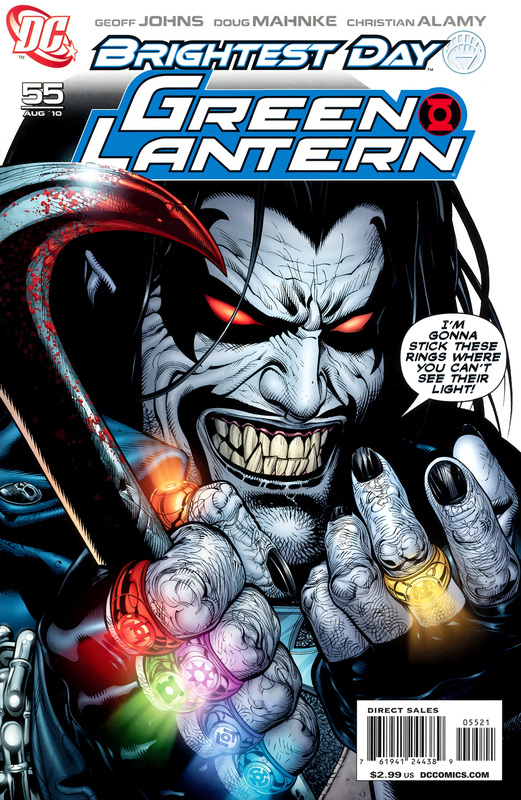 Dex-Starr’s first appearance is actually Final Crisis: Rage of the Red Lanterns #1. If memory serves, this comic contains his origin story.